People usually opt for in ground pools mainly because they aren’t aware of some of the main benefits of the above ground pools. It’s not that in ground pools aren’t good, in fact, it’s just that the above ground ones are more cost effective and they come with several benefits that cannot be denied. Also, if you are someone who is planning to get a pool in the house then this article is a must read for you because first of all, the above ground pools are trending at the moment and secondly today in this article we are going to jot down some of the most amazing benefits of above ground pools that cannot be denied in any case. Even if you are rich, you’d still love the idea of saving some money and well, if you really want to save some then you need to opt for an above ground pool. You see the cost of an in ground pool starts from $15000 and it goes upto $20,000 which is pretty expensive but on the other hand, the cost of the above ground pool starts from $1500 which is quite affordable even for an average family that earns average. Now, it is but very obvious that you will go for the pool that costs you less because ultimately at the end of the day, it’s a pool and whether it’s an in ground pool or an above ground pool, they both have the same benefits and the same fun. In ground pools are quite a time taking, and it can take you a whole month to install one but on the other hand, when it comes to the above ground pools, you can get them installed in literally a single day. Yes, you read it right, the point is that the kits for above ground pools are already ready and you just need to install them wherever you want. In ground pools need proper designing and planning and well, the digging the ground part is also quite time taking. 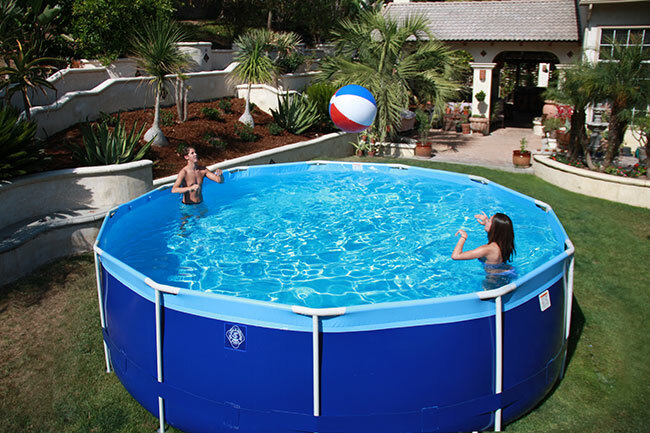 So, if you really want to save your time then start looking for the best above ground pool instead of an in ground one. Another benefit of an above ground pool is that they require lesser space. So, if you are someone who has limited ground space and if you really want to get a pool in your house then congratulations, an above ground pool is the best option for you as they are ready to be installed and they don’t need any digging etc. It’s all settled when it comes to an above ground pool. If you ever feel the need to remove or relocate your pool then remember that an inground pool will be very costly for you and even if you remove it, the pool will still stay there. However, that’s not the case with an above ground pool and if you ever want to relocate it, you can do that easily within a single day. Yes, you read it right and removing an above ground pool won’t even cost you much. These are some of the benefits of an above ground pool. So, now, if you really want to save your time, money and energy then don’t think anymore and get yourself an above ground pool right now. We assure you that no matter what happens, you won’t ever regret your decision.